Taste of Design, the exclusive interior design road show, has announced a series of new show dates for spring 2019. Regarded as an essential date in the diary for interior design professionals, Taste of Design combines high-end interiors with beautiful locations around the UK. Hosted by a select group of leading brands, the annual event sees the UK’s finest names in interior design showcase their talent at some of the country’s most iconic venues. Taste of Design provides a relaxed and memorable series of days for exhibitors and visitors alike. With five dates set at exclusive venues throughout May, visitors can look forward to a preview of the latest furnishing designs from quality brands including four brand new exhibitors Ailanto, Chase Erwin, Roger Oates and William Yeoward. Between 14th and 22nd May 2019, Taste of Design will be taking place at fabulous locations including Hylands House, the Sculpture Gallery at Woburn, Stoneleigh Abbey, Painshill and Leigh Court. Previous sites include the likes of Mercedez-Benz World at Brooklands Hall, Belvoir Castle, Hatfield House and Highclere, the setting of Downtown Abbey. The deepest, densest, smoothest and most luxurious wool carpet in Jacaranda’s collection has just got even better with the launch of a contemporary new colour palette. We’re proud of our spectrum of natural shades from cool greys to warmer, richer tones and have broadened this range to include new soft blues and subtle greens which we hope you love. At Jacaranda we believe wool still makes the best carpets. What other fibre is natural and renewable, regulates moisture and muffles noise. The springy structure of wool fibres resist crushing and wear, they even come naturally coated with lanolin for chemical free stain resistance. 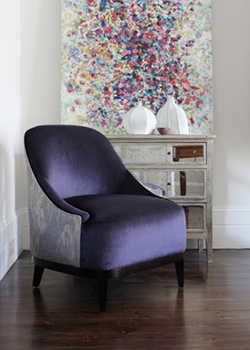 Jacaranda’s Heavy Velvet broadloom is hand-woven from 100% pure wool using artisan skills on traditional wooden looms. We guarantee it against moths for 5 years. 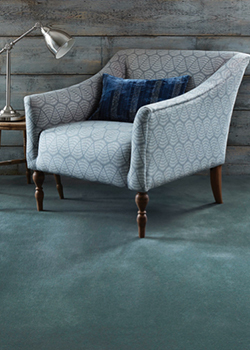 We stock it as 4m & 5m broadloom to allow seam-free installation in larger rooms. Rugs can be made to measure, blind hemmed or bordered. This is an exhibition of note for Gainsborough Fine Weavers and Dye House, named as we are after Thomas Gainsborough, a son of Sudbury, Suffolk, where we are still based. 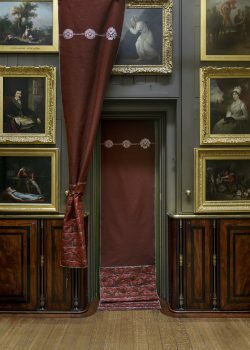 Gainsborough has for decades woven walling and curtain fabrics for the world’s greatest art galleries and, to celebrate that connection as well as the eponymous link to this artist, the National Portrait Gallery has employed Gainsborough fabrics to create a range of lovely accessories. The Chase Erwin story is an impressive one that spans over 30 years of collections, with many designs and countless details that exude unprecedented luxury and evoke a unique Nordic sense of style. An innovator in the industry, company director Ragna Erwin began creating fabrics that were heavily influenced by her Icelandic roots. Offering muted colour palettes of clean greys, glacier blues and soft snow whites, in a market that was saturated with bold primary colours. Chase Erwin is celebrated for their beautiful silk collections and as the company has grown it has evolved with linen, wool, cashmere, luxury fibres including mohair and silk velvet and now leather. All articles possess quality, crafted using only the finest yarns in artisan mills. From subtle neutrals and muted pastels to lively accents and rich dark hues, each collection tells its own story. Founded in 1903, Gainsborough Fine Weavers & Dye House embodies over a century of British craftsmanship. 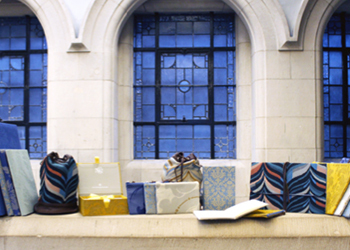 Awarded the Royal Warrant in 1981 they design, hand-dye and weave collections and bespoke fabrics for interior designers, private homes, palaces, public spaces, yachts and automobiles around the world. Since 1924, the entire production process – from design, to hand-dyeing, winding and warping the yarns and weaving the finished fabrics – has taken place on the same site in Suffolk. This in-house control ensures peerless quality allowing Gainsborough to support craftspeople and bring their creative visions to life. Each year, new and intriguing venues are carefully selected up and down the United Kingdom, with a long-term intention to bring the show and the brands to every corner of the country. Venues are chosen for their beauty, interesting history, gardens and ambience, as well as their geographical location. The objective is to provide you with an enjoyable and relaxing environment, as well as the opportunity to view lovely interiors products and services in a sympathetic setting.